Photo: Mesick House, ca. 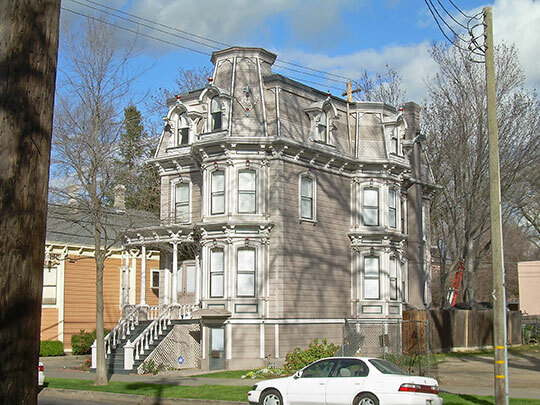 1875, 517 8th Street, Sacramento, CA. Listed on the National Register of Historic Places in 1989. Photographed by User:David Sawyer (own work), 2008, [cc-by-2.0 (creativecommons.org/licenses/by/2.0)], via Wikimedia Commons, accessed August, 2015. Sacramento is the county seat of Sacramento County and the state capital of California. It is one of the original counties of the state, being formed in 1850. The county is named for the Sacramento River which was in turn named (Santisimo Sacramento — Holy Sacrament) by Spanish cavalry officer Gabriel Moraga. Moraga explored the central valley of California around 1807. In addition Moraga is credited with many of the region's place names including San Joaquin, Merced River, Kings River, Mariposa (butterflies) and Calaveras (human skulls).